These are the proceedings of an international conference organized by the Spanish National Research Council (CSIC), the Institute for Space Studies of Catalonia (IEEC), the NASA Exoplanet Science Institute (NExScI), and the Blue Dots Initiative. One of the most important scientific challenges for the 21st century is the search for habitable worlds around other stars and the characterization of their atmospheres, with the goal of detecting signs of biological activity. This is a long-term, interdisciplinary endeavor, engaging astrophysicists, biologists, planetary scientists, and instrument scientists. Eventually, space missions will be used to search for habitable planets, but today we need to start taking intermediate steps in that direction. The aim of this conference was to help integrate the prospective efforts in Europe and in the U.S., build a community around the theme of finding and characterizing habitable planets, and bring together several potential pathways towards that final goal. The conference included introductory lectures, invited talks, contributed talks, and posters presented by attendees from around the world. Sessions included reviews of working groups on multiple aperture imaging, single aperture imaging, transits, habitability, and characterizing exoplanets. 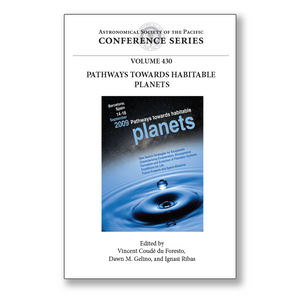 Summaries of astrophysical methods and projects are included in this volume, as well as a summary of the panel discussions on some of the key issues. This volume also includes several papers providing a broad picture on the search for life elsewhere in the universe.